On July 1, 2014, St. Anne, Sacred Heart (Kawkawlin) and St. Valentine (Beaver) merged to form a new parish, Prince of Peace Parish. St. Anne will serve as the parish church. St. Anne was the wife of Joachim, the mother of Mary and the grandmother of Jesus. Anne and Joachim were childless for many years until Joachim went into the desert to pray for a child and was told by an angel that he and Anne would have a daughter. Their child was to be named Mary and was to be dedicated to God. Feast day: July 26. Six lots were cleared on Aug. 9, 1884, when Bishop Henry J. Richter of Grand Rapids gave his consent to build a 40 x 60 foot structure. Father Charles Dequoy celebrated the first Mass on Nov. 22, 1891. As there were no pews in the church, the people sat on pieces of log atop planks of wood. The church was destroyed by fire in 1916, along with many early church records. 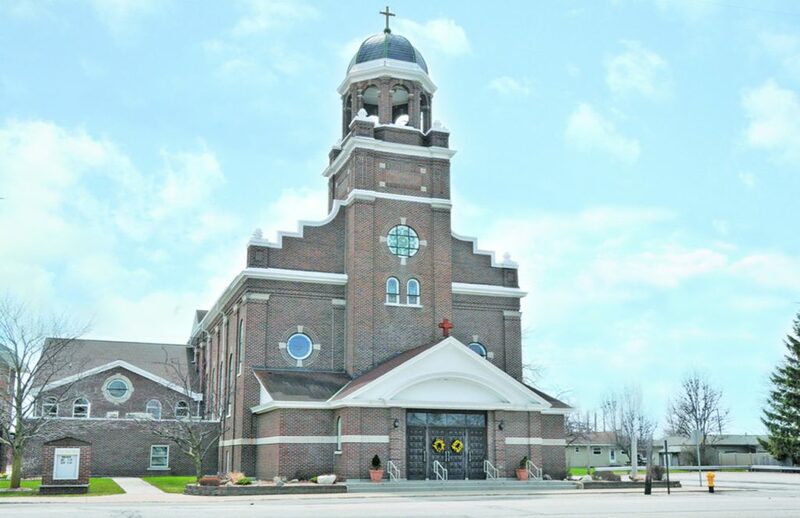 A beautiful brick church was dedicated on July 31, 1921. The church’s Romanesque construction features a dramatic bell tower, impressive stained-glass windows created and installed by Detroit Stained-glass Works and a 1,450-pound bell cast by the Stuckstede Bell Foundry Company of St. Louis, MO. The Stations of the Cross are large oil paintings on canvas that were restored in 2010.